Recently coming to a close, the M1 Fringe Festival celebrates its 10th anniversary this year. And if attendance figures are anything to go by (14,000 in total! ), it looks like 2014 is set to be a promising year for theatre and the arts in Singapore. The performances seen during this year’s festival were indeed engaging and thought-provoking — one of which would definitely be Working On a Special Day. 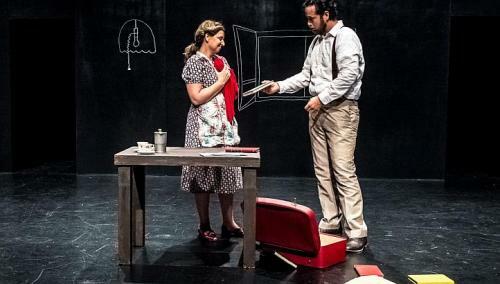 A joint collaboration between Mexican-Based theatre company Por Piedad Teatro and The Play Company from the USA, the production is actually an adaptation of Ettore Scola’s Oscar-nominated Italian film Una Giornata Particolare (A Special Day). The year is 1938 and the date is May 8th, the historic day in which Hitler’s visit to Mussolini is celebrated by the Roman people. Amidst all the excitement, it’s yet another ordinary day for housewife Antonietta (Ana Graham). Whilst her fascist husband and six children head off to the parade to catch Hitler’s arrival, Antonietta stays at home to finish an endless array of domestic chores. All appears normal and well until Antonietta’s pet parrot Rosamunda escapes from her cage and flies into the apartment building of the gentlemen next door. It’s not quite an ordinary day for the gentlemen Gabriele (Antonio Vega) though. On the verge of suicide with a gun to his head, Antonietta’s presence thankfully interrupts his attempt. He proceeds to help her recapture her bird, and the two warm up quickly and spend the day in each other’s company. This finally culminates in a passionate kiss between them, after which Antonietta is shocked to find out of Gabriele’s homosexuality, something which could not even be spoken of in Fascist Italy. Despite this, the two eventually overcome their differences and learn to accept one another, right before Gabriele is deported to Sardinia at the end. The play undoubtable raises important themes that are relevant and universal across all times and places, despite the setting being Italy in the 1930s. Issues of openness and acceptance towards different groups of people (be it gays, people who adopt different ideologies and the like) are brought up, as Antonietta learns to connect with Gabriele on a deeply personal level despite his anti-fascist stance and sexual orientation. The play highlights the fact that we are so often quick to put labels on people that we forget they are human beings as well-capable of love, hurt, and all other feelings in between. Another interesting theme explored was that of fascism, not only as a political regime implemented by a government but also as a state of mind. Antonietta is somewhat infatuated with Mussolini, naïve and unquestioning of her leader until she meets Gabriele who has been discriminated and ill-treated by the system. In the earlier part of the play, Antonietta demands that Gabriele leave her home immediately upon hearing of his anti-fascism. Here we see how prejudiced and dictatorial ways of thinking are played out in simple everyday encounters, so deeply internalised by the people to the extent that it colours their view of the world and those around them. Not only does the play manage to bring important social issues to the fore, it also succeeds in unleashing the audience’s imagination. This is no doubt due to its innovate method of staging. The set was kept minimal, with only a few pieces of furniture and props. 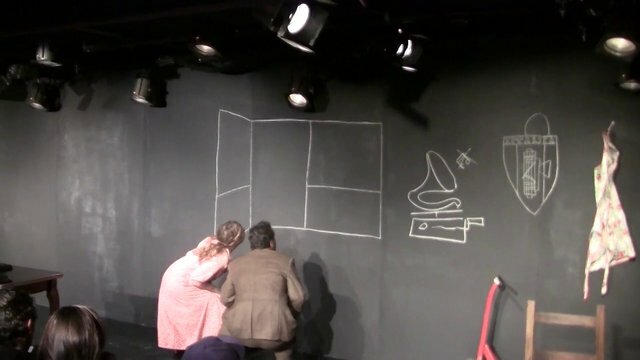 Both actors actually drew out many of the props on the walls using pieces of chalk, such as windows, a lamp and even a birdcage. This proved to be extremely enjoyable to watch, and the actors’ resourcefulness and creativity were particularly inspiring. Last but definitely not least would be the amazing chemistry between performers Ana Graham and Antonio Vega. The husband and wife team in fact co-directed one another, and their rapport and intensity on stage clearly suggest their skill and competence as theatre practitioners. As this production goes to show, you don’t need glitzy costumes and a big-budget set to create good theatre. Sometimes, all you need is a simple yet powerful story coupled with dedicated actors who believe in theatre’s potential to change the world: one play at a time.